Chicago’s punk underworld has reimagined itself several times over the past twenty years, from the cavorting slime punk damage of the early 2000s, through the fracturing of styles and directions a few years later, it’s all been simmering salaciously for generations now, and for the last few years, only a few really noteworthy band have grasped the raw agitation as well as The Sueves. Rearing their ugliness up through the tropes of plastic flowers and goofy sunglasses, these brave young ravagers are not content to sit idly by as the stench of indifference passes over the masses, always the “least chill” band at the party and that is really a good thing. You can’t just sit still when The Sueves are wielding their wares, both in person and on record, the aggression has to burst out somehow, and although it’s far, far easier to just appeal to the low-hanging fruit dangling at the bottom of the rock’n roll food chain, it’s far more respectable to be the ones who are bleeding and bruised, flipping over the tables & chairs with reckless abandon, every single time. 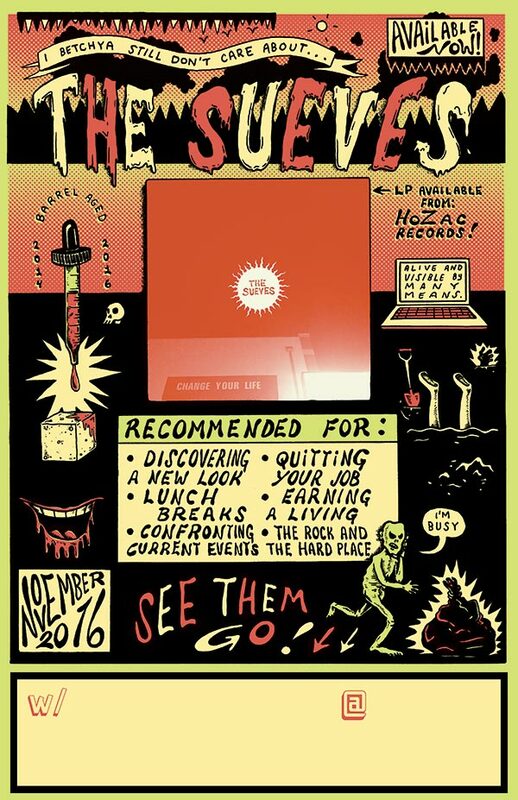 Grab a copy of their debut LP from their well-stocked merch table at the shows, or grab a copy direct from HoZac right HERE.